A New York woman who says she cannot find a job is suing the college where she obtained a bachelor's degree, the New York Post reports. She is seeking to recover $70,000 (£42,000) she spent on tuition to get her information technology degree. 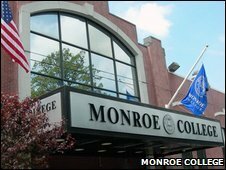 Monroe College spokesman Gary Axelbank said Ms Thompson's lawsuit was "completely without merit". Her mother, Carol, said her daughter was "very angry at her situation" having "put all her faith" in her college. With her student loans coming due, the family would be saddled with more debt, the graduate's mother added. "The college prides itself on the excellent career-development support that we provide to each of our students, and this case does not deserve further consideration," its spokesman said.